Maximize your vacation fun when you stay in this one-of-a-kind Pigeon Forge Cabin! Access the cabin without steep mountain roads. The chalet is just a short drive back to The Cal Ripken Experience, Margaritaville, Dollywood, and all the fun, shopping, dining, and attractions in Pigeon Forge! Enter from the paved loop driveway into the vaulted living room with LED TV, WiFi, & color changing electric fireplace. A full kitchen with stainless appliances and an outdoor grilling area make dining-in a treat! Downstairs the game room includes a full size pool table, Wii, X-box, a 2nd living area, and an oversized hotub with 51 jets for the ultimate relaxation. 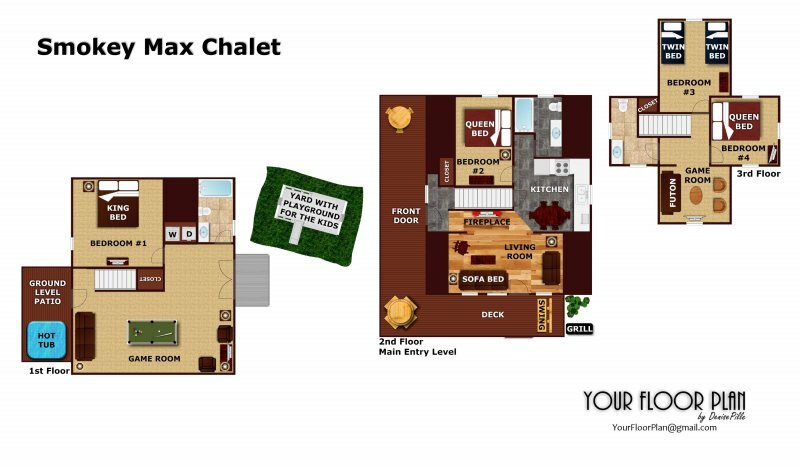 Four bedrooms on 3 levels, & a living room sleeper sofa provide space for 10 guests to enjoy SMOKEY MAX CHALET! Outside a useable yard include playground for kids too. This year, take your vacation to the MAX and plan your getaway in this fun Pigeon Forge chalet. Call today to reserve your vacation dates!